Active Ingredients: Salicylic Acid (40%). 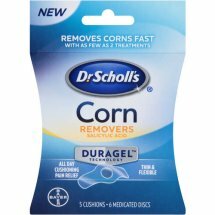 Purpose: Corn Remover. Inactive Ingredients: Antioxidant (CAS 991-84-4), Iron Oxides, Mineral Oil, Petroleum Hydrocarbon Resin, Silicon Dioxide, Synthetic Polyisoprene Rubber, Talc.